English Freemasonry is alive and well in Portugal. Since St.Patrick´s Day, March 17th 1990, when the Rt.Hon Lord Farnham consecrated Prince Henry The Navigator Lodge No.9360, regular freemasonry has been practised in Portugal as part of the United Grand Lodge of England. The Lodge was consecrated in the middle of the Algarve, under the masonic authority of the District Grand Lodge of Gibraltar, the oldest District Grand Lodge in the United Grand Lodge of England. The old and the new coming together to fulfill the aspirations of so many expatriate English freemasons living in Portugal. By 1990 English freemasonry was not the only regular freemasonry in Portugal, Dr. Fernando Teixeira had earlier taken a number of Portuguese freemasons out of the irregular Grand Orient Lusitano in order to practise regular freemasonry. In June 1990 the Grande Loge Nationale Française constituted these as one of their overseas District Grand Lodges, which later became the Grande Loja Regular de Portugal, with Dr. Teixeira as the first Grand Master. English freemasonry grew steadily. There are now four English Lodges and three Royal Arch Chapters, operating across the Algarve and in the Greater Lisbon area. On 17th January 2011 V.W. Bro. Robert Scott Levitt was confirmed as the new Grand Inspector by M.W. Bro. David Williamson, Assistant Grand Master assisted by R.W. Bro. Nigel Brown, Grand Secretary. He succeeded V.W. Bro. Tony Jordan who had been Grand Inspector since 2003. Bro. Levitt is a Warwickshire Mason having been initiated into Barnard Lodge No 5100 in 1972 and was its Master in 1980. 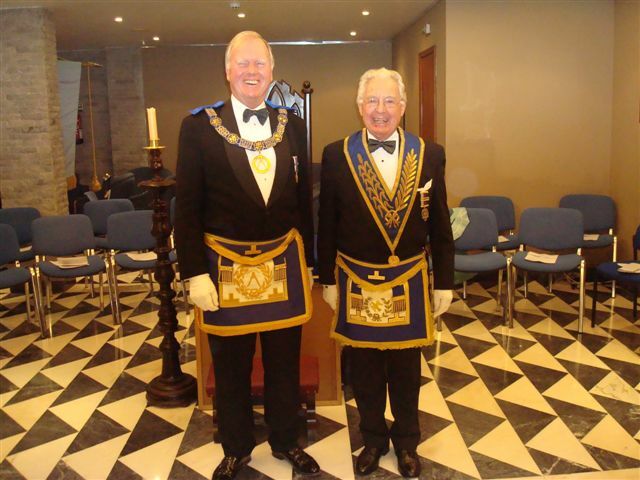 He moved to Portugal in 1981 and was the Founding Secretary when Prince Henry the Navigator Lodge was Consecrated by the late Lord Farnham, then the Assistant Grand Master. The first Exaltee of Prince Henry the Navigator Chapter and its First Principal in 2000, a founder of Britannia Masters Lodge No 9575 and Master in 2005. In 2002 he was the Founding Principal Sojourner of Lancaster Chapter and First Principal in 2005 and 2005. Membership of the English Lodges and Chapters is open to anyone suitably qualified irrespective of nationality, as long as they have reasonable fluency in the English language. All the meetings are in English; follow traditional content, practice and style; masonic dress and English regalia; a festive board following. The Lodges work fairly strict Emulation ritual; the Chapters use the Domatic ritual. They all seek high standards. Freemasonry is much more than attending meetings and eating dinners with like-minded friends, as most freemasons appreciate. In Portugal it is all the things that a good freemason would expect of it, plus a very substantial social dimension not often found in the U.K. It is about involving the whole family; bringing our families with us into our masonic lives; expanding our social experience; enriching the happiness we enjoy from doing things together, with our family, amongst our very special friends who are freemasons. Qualified visitors are very welcome to our meetings. Suitable new members are our lifeblood for the future. Anyone seeking information should contact one of the members listed against the Lodges listed above.